The film opens when Mrs. Rittenhouse is hosting gala at her manor. Captain Spaulding arrives from an African safari ironically singing “I must be going” and selling insurance to Mrs. Rittenhouse. Signor Emanuel Ravelli shows up (Chico Marx) along with the professor (Harpo Marx), who never speaks. The hijinks and puns are fluid throughout the film as the brothers all become involved in various ironic situations. Some examples include when Harpo literally bounces a check on the floor, when Chico says “you go Uruguay and I’ll go mine,” and when Groucho says, “One morning I shot an elephant in my pajamas. How he got in my pajamas I don’t know,” or “We took some pictures of the native girls but they weren’t developed. We’re going back again in a couple of weeks.” One of the funniest scenes occurs when they are all gathered round a table playing cards cheating and remaking the rules of the game. 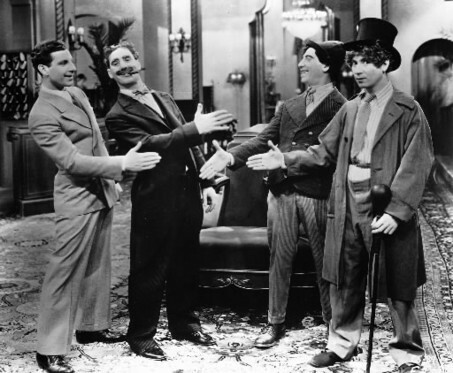 Other continuing jokes include when Groucho takes an aside to audience and recites lines from Eugene O’Neill’s plays, Groucho reintroduces himself to several different characters, and Chico asks Harpo for a “flash” and Harpo continues to pull items out of his pants including a fish, flask, flute, a flit, a flush and others. The plot follows the stealing and replacing of an expensive painting in the manor. Eventually everyone is knocked out when the police arrive, except the Professor who knocks himself out. 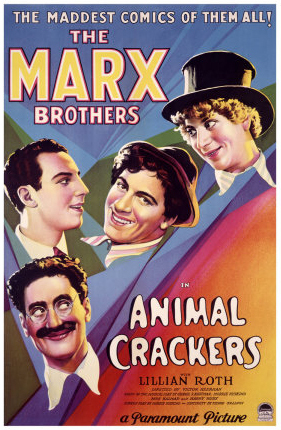 Animal Crackers is a hilarious film that is one of the greatest comedies made by the Marx Brothers. It is one worth watching again and again.